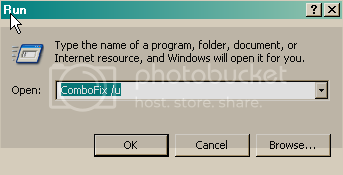 Result - Windows would not let me create or return to a restore point. C:\Program Files\PeDevice (Adware.Popups) -> Quarantined and deleted successfully. C:\Program Files\PeDevice\pae_url.xml (Adware.Popups) -> Quarantined and deleted successfully. C:\WINDOWS\system32\drivers\srosa.sys (Rootkit.Bagle) -> Quarantined and deleted successfully. C:\WINDOWS\system32\drivers\hldrrr.exe (Rootkit.Agent) -> Delete on reboot. C:\Program Files\setup.exe (Rogue.Installer) -> Quarantined and deleted successfully. Edited by ajdedo, 10 June 2008 - 01:36 PM. ADS - svchost.exe: deleted 228 bytes in 1 streams. ADS - ntoskrnl.exe: deleted 100 bytes in 1 streams. ADS - explorer.exe: deleted 164 bytes in 1 streams. "Launch LCDMon"="C:\Program Files\Common Files\Logitech\LCD Manager\lcdmon.exe"
I can only run online scans that do not require an internet connection when they finish. Edited by ajdedo, 14 June 2008 - 09:25 PM. Hi, I'm not sure if I should delete the files found by Dr. Web. They seem to be mostly the virus scanners I was instructed to download. The program is still waiting for my input. Should I clean the files that Dr.Web pointed out? They include Combo-fix, malware-bytes, Partition majic? Also, can I reboot my computer to re-establish internet connection? Edited by ajdedo, 15 June 2008 - 03:27 PM. As for the computer.... Well, neither my NOD32 or my Zone Alarm will load. I still get "NOD32.exe is not a valid Win32 application" when I try manually. I also get a strange thing when I startup. An image of the mouse pointer with the hour-glass darts across the bottom of my screen several time before appearing in the middle of my desktop. This only started happening after I got infected. There are still some things that are acting funny. 1) I still get that mouse pointer darting across the bottom of my screen over and over when I log on. 4) Also, my computer spontaneously rebooted during the Kaspersky scan. I sill have the above issues with the mouse pointer and video driver, as well as countless "detected: riskware Invader" warnings. Edited by ajdedo, 16 June 2008 - 01:05 AM.